We are one of the prominent Supplier and Exporters of Bimat Eye Drop. We carry out our operations from Maharashtra, India. Our offered Bimat Eye Drops are used to treat hypotrichosis (short eyelashes). It increases the length, thickness, and color of the eyelashes. These eye drops are also used to reduce the intraocular pressure in patients diagnosed with glaucoma. We are competent to take bulk orders for these Eye Drops. 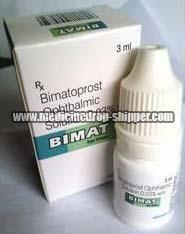 We offer Bimat Eye Drop all over the globe, at very reasonable prices.